Some of the weight-saving however is attributable to the 2-litre Ingenium diesel not features in the previous model. And some might see the associated energy balance and life cycle cost as being two down-sides of aluminium and which have to be assessed against greenhouse gas (GHG) emissions. However, Jaguar sees aluminium alloys, self-piercing rivets from Henrob and structural adhesives are the essential elements around which every Jaguar is designed. Used to create inherently light, stiff body structures, they enable the highest standards of performance, efficiency, safety and dynamics, claims the company. Aluminium is also used to make the bonnet and front fenders, while the front-end carrier and cross-car beam are cast from lighter magnesium alloys. Combined with the other weight savings made throughout the vehicle, this makes the all-new XF up to 190kg lighter than its predecessor. “The move from an all-steel to aluminium-intensive monocoque leverages more than a decade of experience of manufacturing luxury cars from aluminium in high volume,” notes Jaguar, before adding that the one-piece bodysides of the all-new XF are testament to Jaguar’s “world-leading expertise in working with the material”. Stamped from a single sheet of high-strength 6000-series alloy, the bodysides weigh less than 6kg. Jaguar engineers claim the bodysides are among the most technically-challenging panels Jaguar has developed and push the limits of what is possible in terms of design and manufacture in aluminium. “Perfecting the deep haunches and the sixth-light incorporated all of the learning from F-TYPE in terms of depth of draw and tightness of radii,” claims Jaguar engineers. Much of the improved refinement comes from reducing structure-borne noise. Critical to this is that the body behaves as a homogeneous structure: wherever vibration energy finds a discontinuity it will concentrate and then radiate noise through to the cabin. Each part of the body has been analysed to ensure that as many potential sources of noise could be designed-out. In some areas, such as the crash structure behind the front bulkhead, fully-sealed, double-wall structures are used. Where sound deadening has been applied, the latest spray-on materials are used due to their combination of higher performance and lower weight. A further example of attention to detail which delivered the all-new XF’s benchmark low levels of cabin noise is typified by the way in which the high-level brake light is fitted to the body. Running all the way along the full length of the rear screen, this LED light has a seal and an acoustic barrier behind that to minimise any noise leakage through to the interior. Jaguar engineers claim the latest XF has been engineered to meet the most demanding crash test requirements. As part of the intelligent material mix in the body, the rear longitudinal members and the B-pillar reinforcements are made from ultra-high strength hot-formed boron steels, providing exceptional rigidity and stability of the occupant safety cell. Pedestrian protection benefits from the more vertical front grille and the improved energy-absorbing properties of the front bumper, enhanced even further by Jaguar’s latest-generation deployable bonnet technology. “I believe the all-new XF is the best looking car in its class. 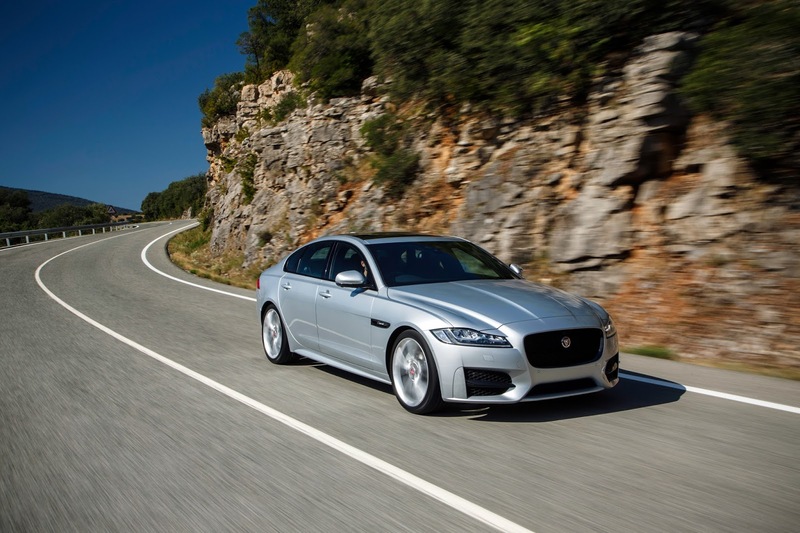 Elegant, handsome and with proportions that imbue a great sense of integrity – the all-new XF is true to the great tradition of sporting Jaguar saloons while being completely of its time,” boasts Ian Callum, director of design, Jaguar. Jaguar claims the 2007 XF was “a radical step forward for Jaguar – and for the business car segment”. Combining a sleek, coupé-like exterior and a luxurious interior, “it set the class benchmark for aesthetics and driving dynamics”, it adds. The new XF retains its predecessor’s core attributes, but uses Jaguar’s aluminium-intensive architecture to enable weight savings of up to 190kg – making the 163PS diesel model 80kg lighter than the nearest competitor – plus an increase in torsional stiffness of up to 28 per cent. “The architecture also delivers dramatic improvements in packaging and the proportions so essential to Jaguar design,” according to Jaguar. The new XF is 4,954mm long: at 2,960 the wheelbase is 51mm longer than before, the front overhang 66mm shorter. Though 7mm shorter and 3mm lower than the original XF, rear seat space is class-leading thanks to 15mm more legroom, 24mm more knee-room and up to 27mm more headroom than before. Aerodynamics have improved with the drag coefficient down from 0.29 to 0.26. The new XF is the first Jaguar to offer adaptive full-LED headlights. Featuring two banks of LEDs and reflectors – one for dipped beam, the other for main beam – they generate light with a colour temperature closer to that of daylight than is achievable with Xenon lights, delivering better illumination, according to the company. At the same time, energy consumption is reduced. Unlike first-generation designs, cooling fans are not needed. The new XF powertrain range consists of the 163PS and 180PS 2-litre Ingenium diesels from the company’s Wolverhampton plant teamed with either six-speed manual or automatic gearboxes (offering 104g/km); RWD 300PS (700Nm torque) 3-litre V6 diesel (with its compacted graphite iron - CGI - vee block) with a ZF automatic transmission; and the RWD supercharged 380PS 3-litre V6 petrol driving through an eight-speed ZF automatic. Great article! You should check metrotech mechanical engineering company in the area of industrial weighing, packaging and automation, offering solutions with a wide range of products.